New line of Cincoze Panel PCs combine innovative modularity, rugged design and versatile I/O with a dependable supply chain and enhanced reliability. 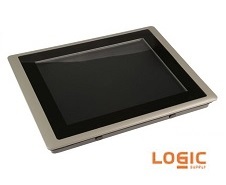 January 6, 2015 (SOUTH BURLINGTON, VT) - In response to client demand for an ultra-reliable, rugged HMI solution, industrial and embedded computer specialist Logic Supply (www.logicsupply.com) has unveiled a new line of multi-touch, fanless panel PCs from hardware manufacturer Cincoze (www.cincoze.com). The systems combine interchangeable Intel Bay Trail-powered industrial computers with ultra-responsive capacitive touch screen displays ranging in size from 10.4 to 17”. These all-in-one solutions combine the power and connectivity of a full featured stand-alone PC with the ease of installation and streamlined design of a panel. The systems are ideally suited for human-machine interface, point of sale, data monitoring, transportation and industrial automation applications in virtually any environment. "Panel PCs have been a pain point for hardware integrators for years, who have struggled to address reliability issues and long lead times," said Logic Supply Product Manager Logan Cooke. "Just holding these panels in your hands you really get a sense of the build quality, and the combination of I/O and modularity make these systems the most versatile HMI solution we’ve ever seen." Fanless and fully ventless to resist dust and airborne debris, the Cincoze panels feature a waterproof IP65-rated front bezel to prevent damage from sprayed or spilled liquids. Measuring a mere 65-72mm deep, the systems have also been engineered for use in temperatures ranging from -20°C to 70°C. Each of these versatile panels feature dual GB LAN and 4 USB ports, one of which is USB 3.0. Other standard I/O includes VGA, DisplayPort, dual RS-232/422/485 COM ports and 8-bit programmable Digital I/O, ideal for data acquisition and industrial M2M applications. The systems can accommodate 2.5” storage drives and offer a full height PCIe Mini Card slot for additional expansion. For applications that feature fluctuating power, the panels are rated for 9~48 V DC input. As an international distributor and a premier Cincoze partner in North America, Logic Supply will provide panel PC integrators with a dependable domestic vendor for these in-demand systems, aiming to resolve the lead time concerns that have plagued the panel PC market. "From food production environments to advanced kiosk applications in remote installations, we’ve seen a growing demand for industrial HMI panels that can stand up to harsh environments that are also readily available to integrators," said Logic Supply Sales Solution Specialist Will McCue. "These new systems will provide our clients with the combination of form factor, connectivity, performance and short lead times that they’ve been asking for." The CV-110C-P1001, CV-112C-P1001, CV-115C-P1001 and CV-117C-P1001 are now available on the Logic Supply website, by calling +1 802 861 2300 (North America), +31 852733760 (Europe) or emailing info@logicsupply.de. The company is also in the process of having these new panel PCs certified as ACP ThinManager-Ready® for implementation in thin client computing applications.